Veteran actor Jake Gyllenhaal will be playing Mysterio in this summer's superhero sequel Spider-Man: Far from Home, and some new merchandise from the movie reveals the actor in character as the sinister Spidey villain. 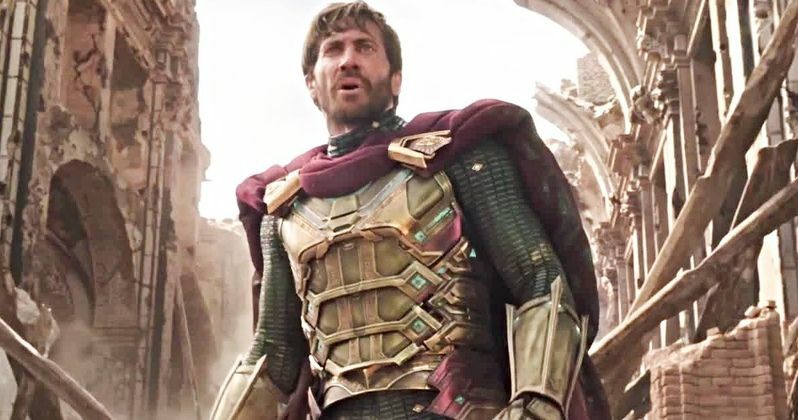 The character's costume looks very faithful to how he appears in the comics, although chances are Gyllenhaal's take on the antagonist will be very different compared to other ways Mysterio has been depicted. It's also worth noting that while the character is one of Spider-Man's most well-known foes, this will officially serve as Mysterio's big screen debut. The closest he had ever come was when Sam Raimi was eyeing Bruce Campbell for the role in his planned Spider-Man 4 sequel, which wound up being abandoned. This will be the first superhero movie for Gyllenhaal, who's never portrayed a hero nor villain in any movie of this type. He was previously rumored to be a potential replacement for Tobey Maguire after his departure from the Spider-Man series, and his name also comes up as a possible new Batman as well. Gyllenhaal previously explained how he'd always been open to appearing in a superhero movie, so as long as he finds the right role. "My response has always been, particularly since being at Sundance [where] so many of the stories [are]... character-driven and that has always been my desire, to find something in that space that seems to match my skill and also what I love and my own honesty," Gyllenhaal explains about accepting the role of Mysterio. "And it just so happened that it does with that part. So, I'm glad that people feel excited about it." New movies with Tom Holland won't be the only Spider-Man movies we can anticipate coming to the big screen. After performing tremendously last winter, Spider-Man: Into the Spider-Verse already has an official sequel in the works which will continue Miles Morales' story. A female-centric spin-off following Spider-Gwen, Spider-Woman, and Silk is also in the works. Other possible spin-offs, including one focusing on Spider-Ham, are also being considered. Of course, these movies are completely unrelated to the Holland's MCU movies, taking place in another universe (Spider-Verse, if you will). Spider-Man: Far From Home will hit theaters everywhere on July 5. We can check in with Tom Holland's Spider-Man before then however when the character returns for Avengers: Endgame, which premieres on April 26. As great as it will be to see how the surviving Marvel superheroes are able to vanquish Thanos and save their pals, I'm anticipating Spidey's big screen battle against Mysterio just as much. You can take a good look at Far From Home's Mysterio below.